A British tea time classic! 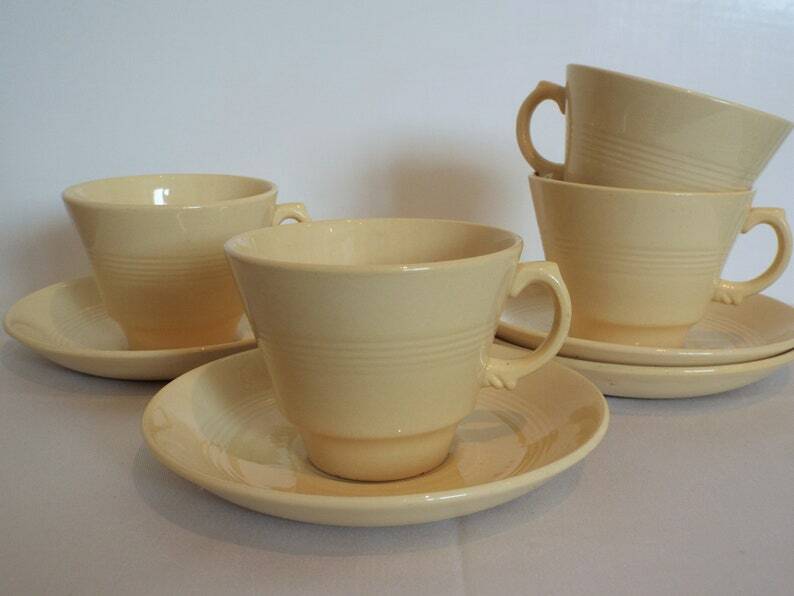 Woods Ware made this style of teacup in a range of retro pastel colours, and this yellow shade is referred to as their 'Jasmine' range. To me, it is just the perfect shade of yellow, so uplifting. Its especially perfect for a spring or Easter teatime, but is just perfect anytime. Woods Ware is made for everyday use, but with a lasting quality and style, which just resonates teatimes post Second World War, in the 1940s and 1950s. A British classic, it deserves to be used an loved again on a daily basis. It would make such a wonderful gift, especially for a birthday, bridal shower or mother's day. It would display beautifully and catch your eye from across the room, bringing a great mid-century touch to your home. In good vintage condition, no chips or cracks. There is crazing of the glaze, which shows up more when the teacup has liquid poured into it. These are not cracks and of no detriment to the soundness or usability of this teacup. Crazing of the glaze is often found in Woods Ware, due to the thickness of the glaze used, which was common in this era of manufacture. There may be the odd tiny and isolated fleck in the pottery in places, but this occurred at manufacture and is perfectly normal. Any further wear there may be is commensurate with and any minor blemishes are typical of the contemporary manufacturing process and part of the piece's character. Please just ask if you would like further photos. Your teacup will arrive carefully packaged and beautifully gift wrapped FOR FREE in vintage style brown paper and ribbon.